International Standard Recording Code or ISRC is a twelve-digit digital code for a audio or video recording, such as title that will be used and heard before pre-mastering. In the case of using the track in a radio broadcast of the ISRC is read automatically. A license management, for example, between broadcaster and label can thus be more precise than the label code. There are other standards for full consumer grade codification, like book has ISBN, Journals has ISSN – we wrote some in our article, Google Books for Authors and Publishers. What is This International Standard Recording Code (ISRC) is? You will notice the need of International Standard Recording Code (ISRC) code as optional in SoundCloud. 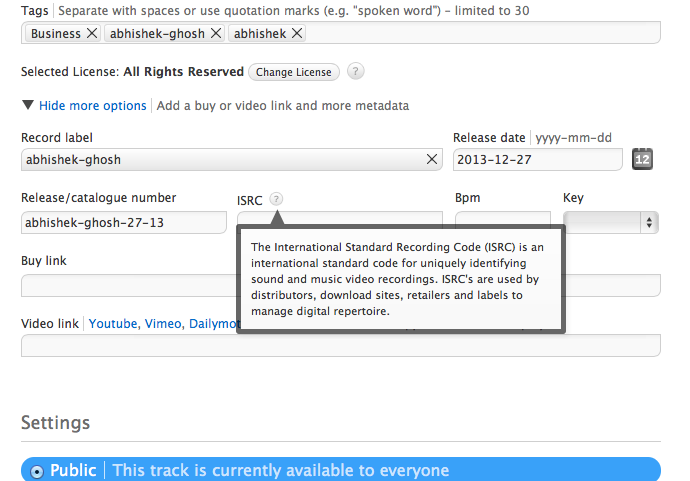 Quite easy example.The International Standard Recording Code (ISRC) identifies a recording. If the original recording appears unchanged, for example, on a new compilation CD, it retains the original ISRC. The ISRC is used for identification only. From it can not be concluded who are the rights holders. This is possible only through the entry in the corresponding databases. If CD title read by computer and stored on the hard drive, most programs ignore the ISRC of the CD tracks, which means the unique identification of a recording is lost, regardless of format, compression level, file name and file size. However, by now we see some audio formats to have an ISRC tag. The ISRC is usually assigned by the label, which at the time of recording had the rights in the Work. In exceptional cases – if the rights holder is unwilling or incapable of publishing it as standard Music or Video – it will get changed. For better readability, the groups in the ISRC are often written separated by spaces or punctuation, as for example, BR-A23 or DR-98-10012 A23 98 10012th In databases, however, the ISRC should be entered without hyphens or spaces. ISRC codes cannot be obtained directly from IFPI. The issuance of ISRCs is overseen country-specific agencies appointed by IFPI. These country agencies may issue codes directly to the public or may utilize authorized ISRC Managers to issue ISRCs. In the United States, the appointed agency is RIAA. Unlike ISBN or ISSN, unfortunately, there is around $36 charge. This Article Has Been Shared 7369 Times! Digital Signature is a cryptographic method in which a value is calculated which is called a digital signature which allow to establish authorship and affiliation. Cite this article as: Abhishek Ghosh, "International Standard Recording Code (ISRC)," in The Customize Windows, December 29, 2013, April 23, 2019, https://thecustomizewindows.com/2013/12/international-standard-recording-code-isrc/.